Apple has released an update to Apple Watch that adds significant new health features to the Apple Watch Series 4, including an ECG app and irregular heart rhythm notifications. The WatchOS 5.1.2 update arrives along with iOS 12.1.1 for iPhone and iPad and MacOS Mojave 10.14.2 for Mac. Of course watchOS 5.1.2 also includes bug fixes, refinements, and some other capabilities for Apple Watch, but the biggest new feature is the inclusion of the health functions, including the ECG app. The release notes for watchOS 5.1.2 are further below. A quick side note; you can use this trick to speed up slow Apple Watch software updates. Remember, only the Apple Watch Series 4 (or later) will support the ECG and irregular heart rhythm features, so if you have an earlier model then you will not have those features available even if you update to the latest watchOS release. Additionally, the ECG feature is currently limited to the USA, but is likely to roll out to other countries and regions as Apple gets the necessary local approvals to do so. 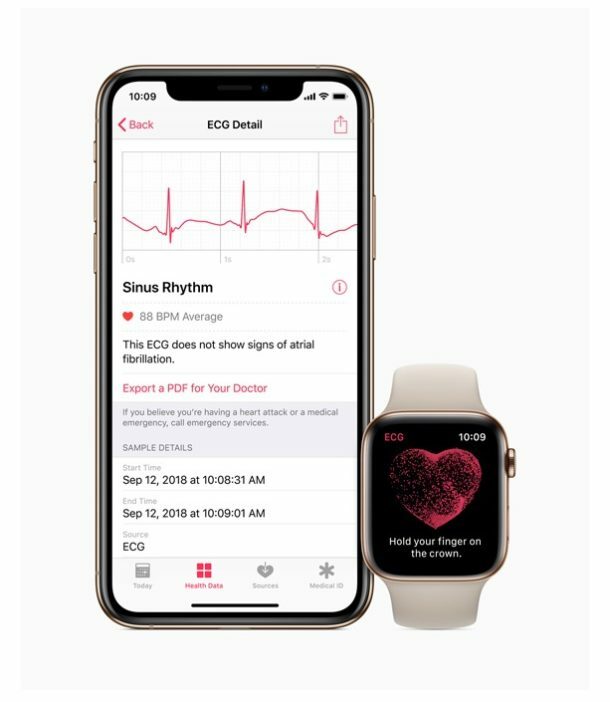 You can learn more about the ECG and Afib detection features of new Apple Watch models in the Apple press release here. These compelling stories, combined with the myriad of health features on Apple Watch (and to a lesser extent, iPhone), are sure to increase the popularity of these devices for the health conscious. — Allows you to take an electrocardiogram similar to a single-lead electrocardiogram. — Can indicate whether your heart rhythm shows signs of atrial fibrillation—a serious form of irregular heart rhythm—or sinus rhythm, which means your heart is beating in a normal pattern. — Saves ECG waveform, classification and any noted symptoms in a PDF on the Health app on iPhone to share with your doctor. – Adds the ability to receive an alert if an irregular heart rhythm that appears to be atrial fibrillation is detected (US and US territories only). – Enables direct access to supported movie tickets, coupons and rewards cards in Wallet when tapped to a contactless reader. – Receive notifications and animated celebrations when you achieve daily maximum points in a day during an Activity competition. – New Infograph complications for Mail, Maps, Messages, Find My Friends, Home, News, Phone and Remote. – Manage your availability for Walkie-Talkie from Control Center. Separately, Apple released an update to tvOS for Apple TV, iOS 12.1.1 for iPhone and iPad, and MacOS Mojave 10.14.2 for Mac. This is the most compelling Apple Watch feature released so far. I would consider getting a new Apple Watch for this, though I hope a future version checks blood pressure and other details too, like glucose somehow. As for my history with the iWatch, I had an Apple Watch first model, then the screen popped off, and it was 2 months out of the 1 year warranty so the Apple store employee told me to take a hike since the warranty was over. Frustrating, and not inspiring. Rubbish! Firstly you call it an iwatch (any REAL user wouldn’t call it that) secondly, my first gen Apple Watch was past the one year warranty when a software update bricked it. Took it to apple, they sent it off and I received a new one in the mail no charge. Thirdly, those screens are locktite in and it takes a heat gun and tools to remove it. Take your trolling shill elsewhere. Actually…the same thing happened to me. Instead of getting it professionally repaired i super glued the screen back on and put a full case around the bezel. Has been intact since. Not available for users from anywhere but the US. And this time Apple went to great lengths to try to ensure that people can’t enable ECG outside the US by restricting its availability based on where the apple watch was purchased (i.e., serial number or maybe model/part number) instead of the region settings as they did with other regionalized features in the past. Not available to anyone but US based users. And this time Apple was nasty enough to make sure it couldn’t be enabled by changing the region setting. As in all apple software, does someone have to log in to their account first to run these life saving programs while using the watch? It could just be me, but I had to remove the beta profile from my apple watch before I could see the update. Everyone who was in the beta program had that problem. I saw several comments about it in different forums. Thanks for the post. Quick question, is there any way to update the watch without the charging base? My watch is fully charged (well, 91%) and I’d like to do the update without having to wait until I get home to do this. Is it possible? Thanks! I wonder if Apple had to get FDA approval for this as a medical device? Does not seem to be available in the UK, Heart Health only shows High and Low Rate limits for notification. It’s not. ECG is only available to US customers, and this time Apple was extra harsh in enforcing the restriction and only allows the app to be enabled on Apple Watch units purchased in the US. This is unlike previous region dependent features or services, which Apple enabled or disabled using the region settings. ECG functionality needs approval by the relevant medical regulatory bodies in each country (e.g. FDA). Possibly they have not yet received approval outside of the US. From what I’ve read in other forums and sites, Apple hasn’t even bothered to apply for approval in any country other than the US. One would think that knowing they would need approval for ECG in each country, Apple would have applied for it in at least a few countries other than the US at the same time when they applied for approval in the US. Yet they didn’t, which shows they really don’t care too much about their customers outside the US.